Make time to ask R U OK. In the frantic lifestyle that we have, it’s all too easy to become overwhelmed with worries that life throws our way. I can speak from my own experience that keeping concerns or worries to yourself can cause them to escalate and consume day to day life. As a bloke, and I’m sure I’m not alone when I say, I’m not the best at talking about feelings. The fear of being judged or feeling emasculated stop me from saying anything more than one word answers. However when these issues or concerns are spoken about and I finally start to say what’s bothering me, the fear or worries that I have been harbouring in my head, which have gotten worse due to them spinning around my head, tend to reduce in magnitude. So whilst at the time I might not be that appreciative of the person who has managed to get me to speak, in hindsight I can really appreciate the time and effort of those close to me who want to listen and help. In today’s buy bactrim online australia society 45% of the population will experience a mental disorder, so being able to help people talk about their worries and fears can only be a good measure in helping to reduce this alarming number. So when you see someone at work who is a little out of sorts and isn’t their usual self, ask them, R U OK? Don’t let what others may think of you get in the way of showing genuine concern for someone, because we ourselves might need to be asked that exact same question in the future. You don’t need to be a psychologist to ask this question, you just need to be a friend. So on R U OK day, take time to think of the impact you may have on someone’s life by having a chat with them and helping them address their worries or concerns and always have a thought for your workmates behaviour and get used to asking, R U OK? 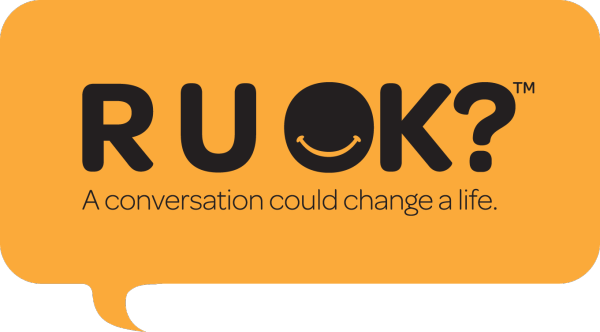 Visit https://ruok.org.au/how-to-ask to see how you can help.